2-1/4" square welded wire construction offers total security and see through visibility. Decks are 3/4" thick layered wood panel mounted flush into an all-welded, 1/8" x 1-1/2" angle iron frame that supports the entire perimeter. Each upper shelf supports 400 lbs., while the doors open on full-length piano hinges. Padlocks not included. Two swivel and 2 rigid casters. Color: blue. 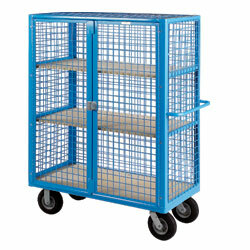 SPECIFY CASTERS: A - 5" polyurethane, B - 8" mold-on rubber, C - 8" pneumatic. IN STOCK. YM-2989A 182	 2000	 3	 17-1/2"	 48" x 24"	 63"
YM-2990A 207	 2000	 3	 17-1/2"	 48" x 30"	 63"
YM-2991A 294	 2000	 3	 17-1/2"	 60" x 30"	 63"
YM-2989B 212	 2000	 3	 17-1/2"	 48" x 24"	 66-1/2"
YM-2990B 237	 2000	 3	 17-1/2"	 48" x 30"	 66-1/2"
YM-2991B 315	 2000	 3	 17-1/2"	 60" x 30"	 66-1/2"
YM-2989C 206	 1200	 3	 17-1/2"	 48" x 24"	 66-1/2"
YM-2990C 231	 1200	 3	 17-1/2"	 48" x 30"	 66-1/2"
YM-2991C 309	 1200	 3	 17-1/2"	 60" x 30"	 66-1/2"
YM-2992A 189	 2000	 3	 17-1/2"	 48" x 24"	 63"
YM-2993A 225	 2000	 3	 17-1/2"	 48" x 30"	 63"
YM-2994A 299	 2000	 3	 17-1/2"	 60" x 30"	 63"
YM-2992B 210	 2000	 3	 17-1/2"	 48" x 24"	 66-1/2"
YM-2993B 246	 2000	 3	 17-1/2"	 48" x 30"	 66-1/2"
YM-2994B 320	 2000	 3	 17-1/2"	 60" x 30"	 66-1/2"
YM-2992C 204	 1200	 3	 17-1/2"	 48" x 24"	 66-1/2"
YM-2993C 240	 1200	 3	 17-1/2"	 48" x 30"	 66-1/2"
YM-2994C 314	 1200	 3	 17-1/2"	 60" x 30"	 66-1/2"